In recent months, Leinster Rugby has said goodbye to several stalwarts. Gordon D’Arcy was denied a definitive send-off because of a shoulder injury, while Kevin McLaughlin, only just installed as captain, was forced to hang up his boots in September. Felix Jones, a former Leinster fledgling, soon followed. Fast-tracked into the Leinster set-up as a teenager, D’Arcy quickly became more renowned for his misadventures rather than for his undoubted potential. He admits that there was a struggle in adjusting to a life that ran without bells and it wasn’t long before Matt Williams had to intervene. Thankfully D’Arcy earned one last chance. He learned his lesson. As did Leinster. It is sometimes said that sport and education enjoys an adversarial relationship. The aspiring athlete can tend to become trapped between the two – the apparent prestige of the sporting landscape and the realities of all that lies beyond that cocoon. Yet both go hand in hand, and Leinster Rugby has acknowledged as much. Since D’Arcy’s introduction, an array of talent has followed through the Leinster ranks. Schoolboy stars such as Rob Kearney, Luke Fitzgerald and Garry Ringrose have all benefitted from the knowledge gleaned by the Leinster hierarchy as a new era dawned for rugby in Ireland in 1998. But now as D’Arcy, McLaughlin and Jones face into life without rugby, they do so with the necessary skills and qualifications required to adapt to the working world. 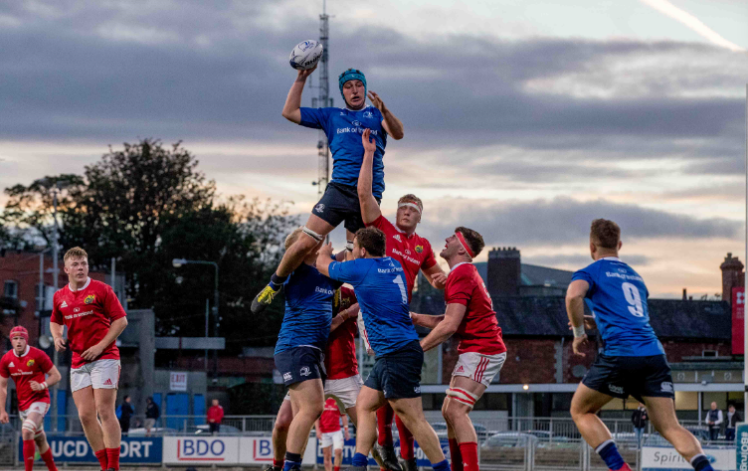 The Leinster Academy is envied across Europe for its ability to produce talented, educated and grounded players on an annual basis. Having been identified and monitored from an early age, players are first invited onto the sub-Academy for a 12-month period – provided that they have completed their secondary education and are deemed to have the requisite potential to play the game at the highest level. Crucially, ability alone will not determine whether a players progresses to the Academy proper as great emphasis is also placed upon an individual’s application and attitude. As all players within the system are pursuing third level qualifications, a player’s flexibility, commitment and time-management come under scrutiny. An education in itself! Amongst the latest crop is Will Connors. With a maturity that belies his years, Connors has a great appreciation for all that Leinster are trying to engender in their charges. Following a fine Senior Cup campaign for Clongowes Wood, Connors was much sought after by various clubs and universities prior to sitting his Leaving Certificate in June. Despite suffering a significant knee ligament injury that threatened to derail his prospects, Connors was proudly selected for the esteemed Ad Astra programme in UCD and enrolled in Computer Science.